In the vastness of space the Algo Star System floats like a dust fleck in a sunbeam. Cruise closer. See its three twinkling planets? The middle one gleams like an emerald! This is Mota, a beautiful, beckoning jewel -- gripped by madness. Tour scenic Mota -- and experience weird research labs, creepy dungeons, catastrophic floods, and exploding planets! Thrill to Mother Brain blowing her circuits! Chill to Climatrol in chaos! Sweat when the killer lurks in the tunnel! Travel light -- in Knife Boots and a Carbonsuit. Stalk boldly into unguarded wilds armed with magic -- Eijia, Foi, and Zan. Stay for lunch with savage Biomonsters -- Head Rot, Pug Hit, and Slugmess. Planet-trot with friends -- Hugh the Biologist, Shir the Thief, Kain the Wrecker. Trade Titanigear with Rudo the Hunter. Solve a twisted riddle! And be ready to die! 01-02-2016 rayman Box Text PHANTASY STAR II 16-BIT CARTRIDGE In the vastness of space the Algo Star System floats like a dust fleck in a sunbeam. Cruise closer. See its three twinkling planets? The middle one gleams like an emerald! This is Mota, a beautiful, beckoning jewel -- gripped by madness. Tour scenic Mota -- and experience weird research labs, creepy dungeons, catastrophic floods, and exploding planets! Thrill to Mother Brain blowing her circuits! Chill to Climatrol in chaos! Sweat when the killer lurks in the tunnel! Travel light -- in Knife Boots and a Carbonsuit. Stalk boldly into unguarded wilds armed with magic -- Eijia, Foi, and Zan. Stay for lunch with savage Biomonsters -- Head Rot, Pug Hit, and Slugmess. Planet-trot with friends -- Hugh the Biologist, Shir the Thief, Kain the Wrecker. Trade Titanigear with Rudo the Hunter. Solve a twisted riddle! And be ready to die! 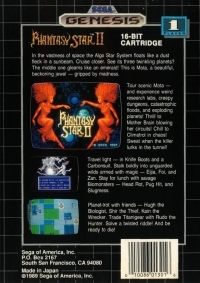 This is a list of VGCollect users who have Phantasy Star II in their Collection. This is a list of VGCollect users who have Phantasy Star II in their Sell List. 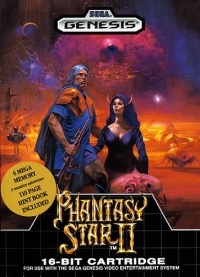 This is a list of VGCollect users who have Phantasy Star II in their Wish List.